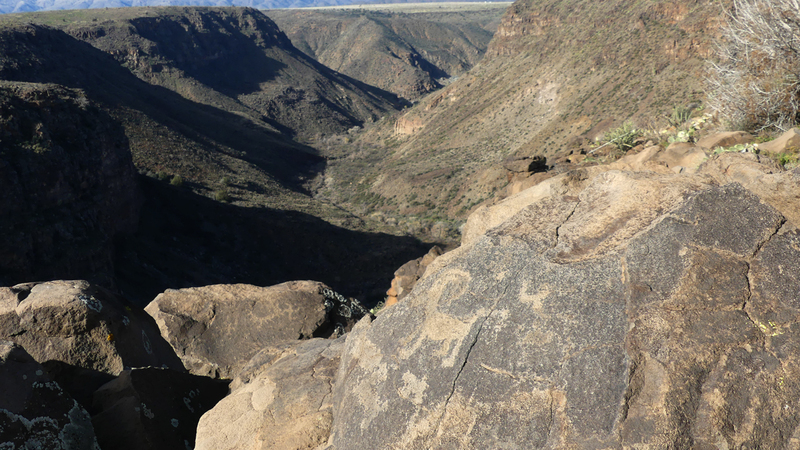 Created in 2000, Agua Fria is likely one of the least developed national monuments, with facilities limited to a single vault toilet. 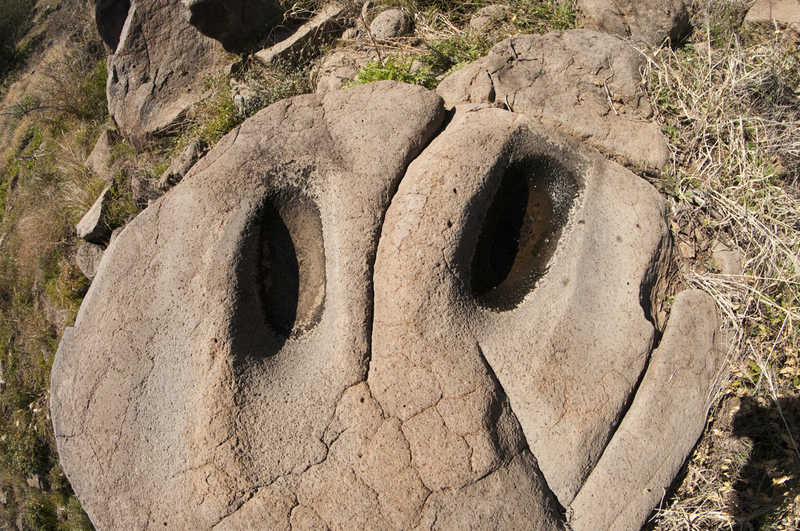 Fortunately, it's also one of the least visited, and the only real protection for these precious cultural resources is that most of them are virtually inaccessible. 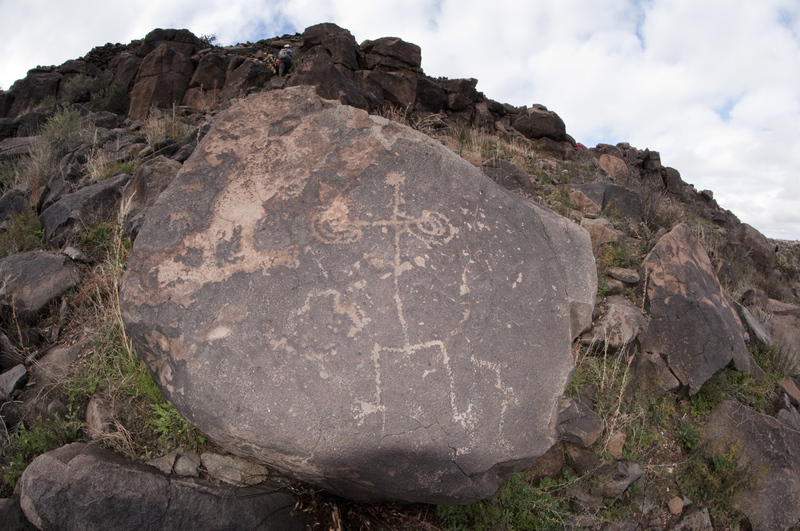 The Hohokam moved up the tributary canyons of the Agua Fria River and onto the mesa top about 1000 AD, drawn by rich volcanic soils and natural rock tanks that could hold up to a year's worth of water. 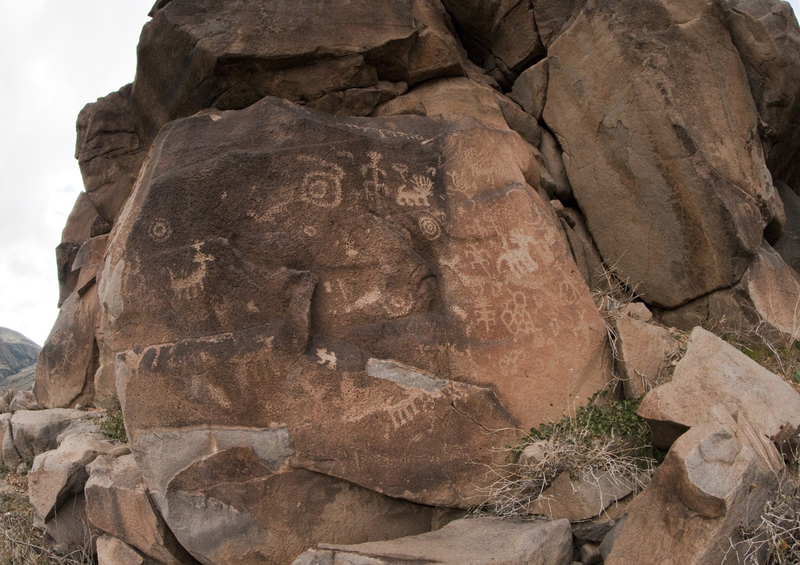 By the mid 1300s the mesa top population was concentrated in seven communities, each made up of one or more large (30-50+ room) structures with a scattering of smaller buildings. 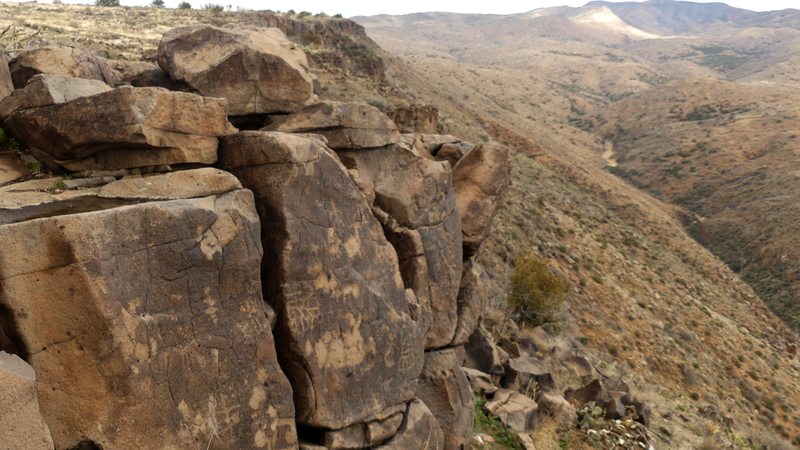 Five of the seven pueblos were located at the edge of the mesa, overlooking steep side canyons of the Agua Fria River. 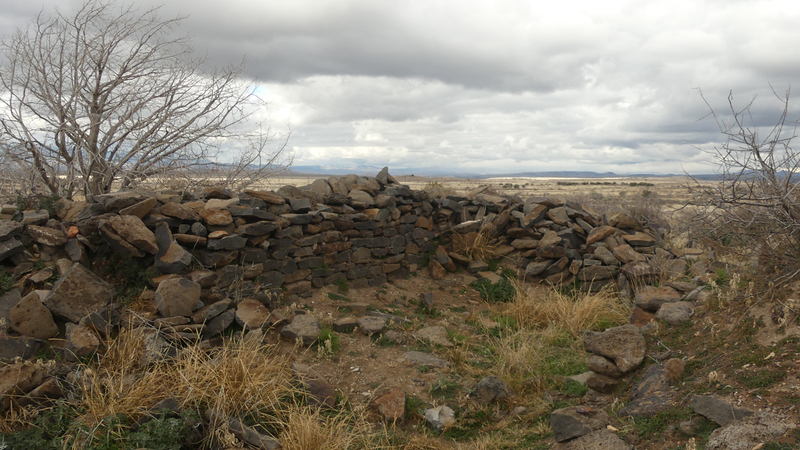 During the late 13th century, a network of fortifications was constructed along the southern and western edges of the mesa, and the local population was greatly augmented by the arrival of some groups who had abandoned the Prescott Highlands in the late 1200s. 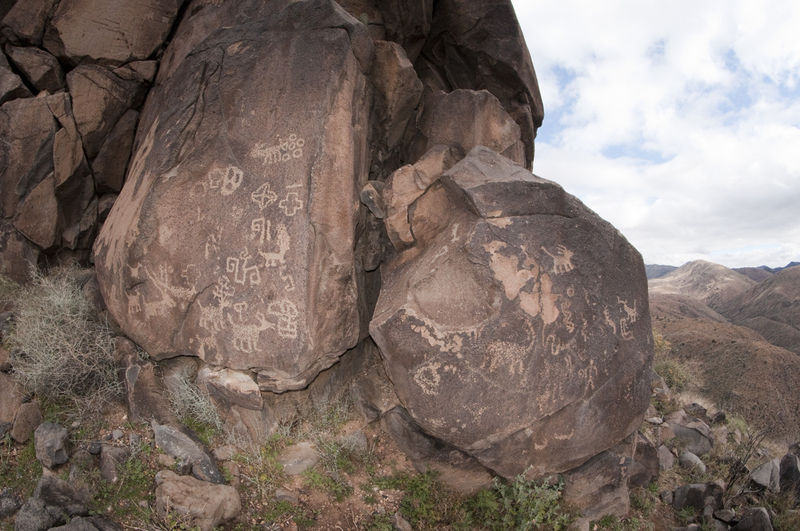 However, by the late 14th century, the mesa top communities were abandoned, and they remained largely unoccupied except for itinerant Tonto, Apache and Yavapai Indians and Basque sheep herders. 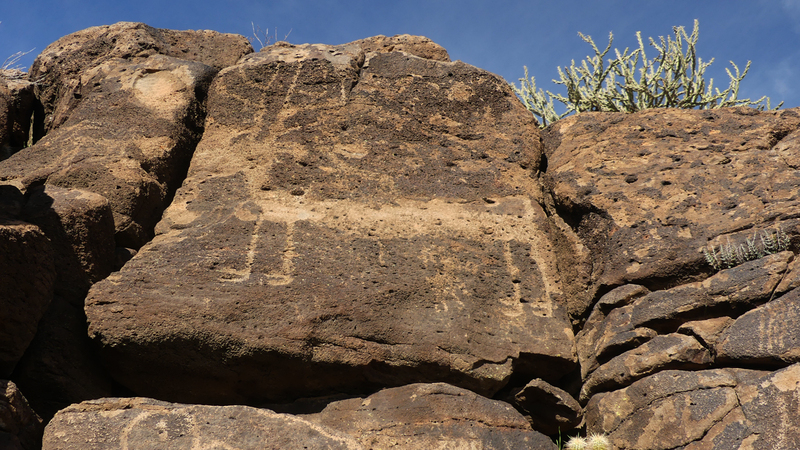 We became aware of this area in 2011, when we stumbled upon the impressive petroglyphs at V-Bar-V Ranch on a trip to Wet Beaver Creek. 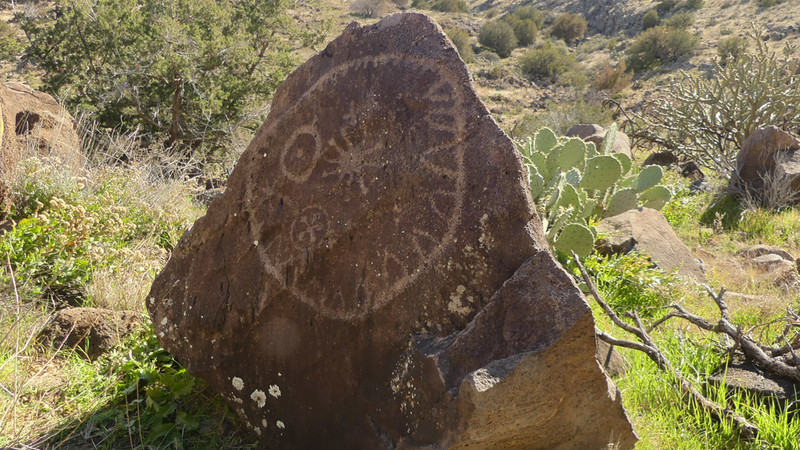 The caretaker told us that somewhere to the south in Agua Fria National Monument was a petroglyph depicting the Supernova of 1054, which was was about four times brighter than Venus and visible in daylight for 23 days, and for 653 days to the naked eye in the night sky. 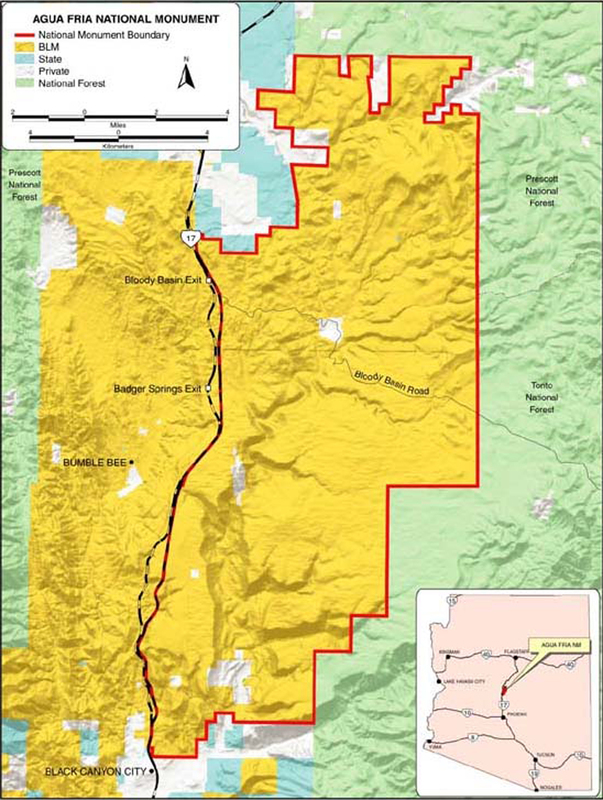 By piecing together various reports, we eventually zeroed in a several possible locations. 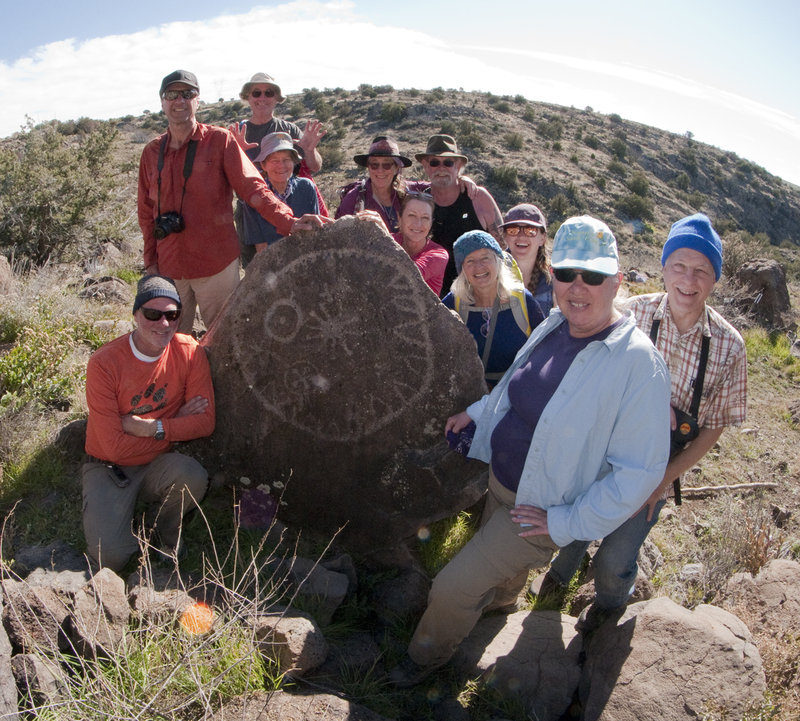 We visited Agua Fria in November, 2012, and, after a day-and-a-half of bushwhacking, we made our way to an impressive wall of petroglyphs including at least one that appears to represent the Supernova of 1054. 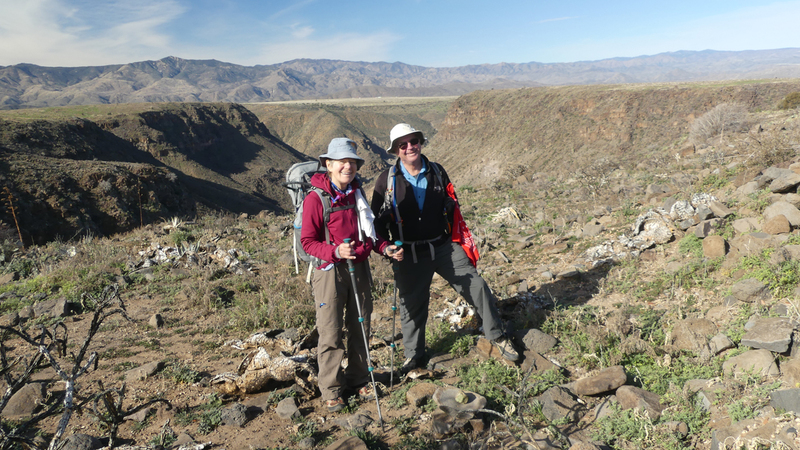 We returned in January, 2019, hoping to revisit that area and also explore the sites of some of the major pueblos. We were startled to see how badly the roads had deteriorated since our first visit seven years ago. Our GPS track from 2012 was useless, since two of the roads are now closed. 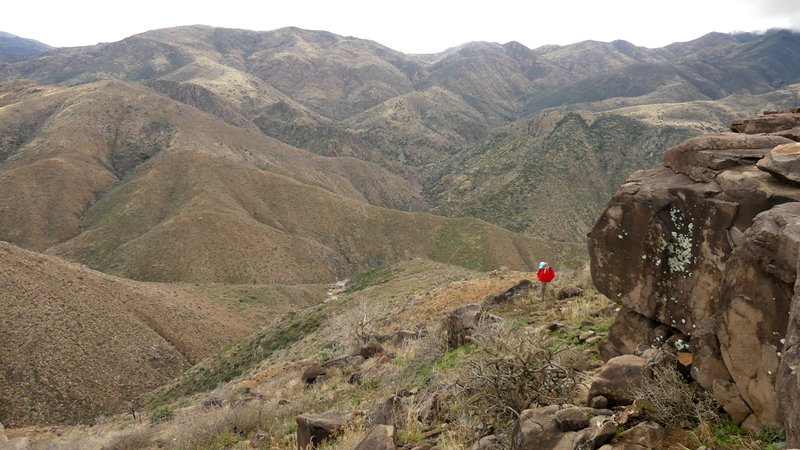 The last five miles were as harrowing as a basically flat dirt road can be, with tire-swallowing ruts and bony boulders. 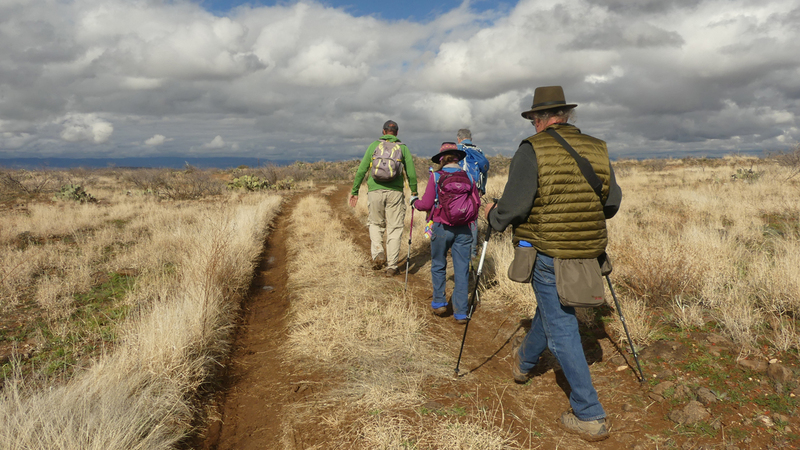 Miraculously, we all managed to find each other on the mesa, thanks in no small part to a solid cell phone signal and FRS radios. 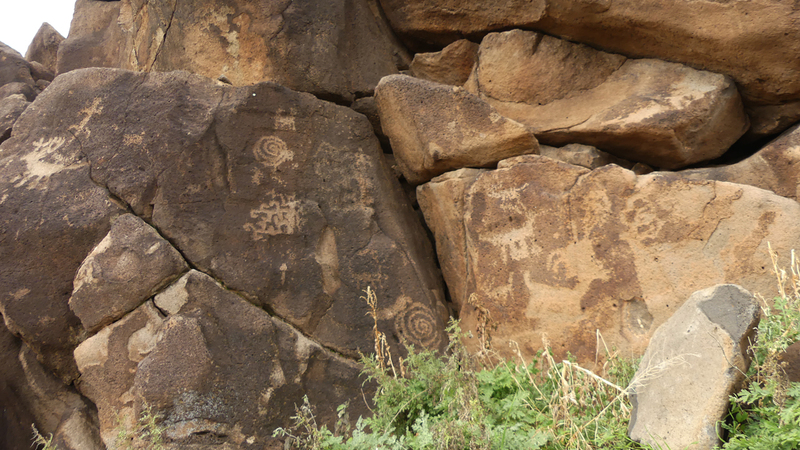 The next morning we set off across country toward the first of the ancient pueblos, which connsisted of at least three buildings, two of which perched dramatically at the edge of the cliff. David and Rogil lead the way. 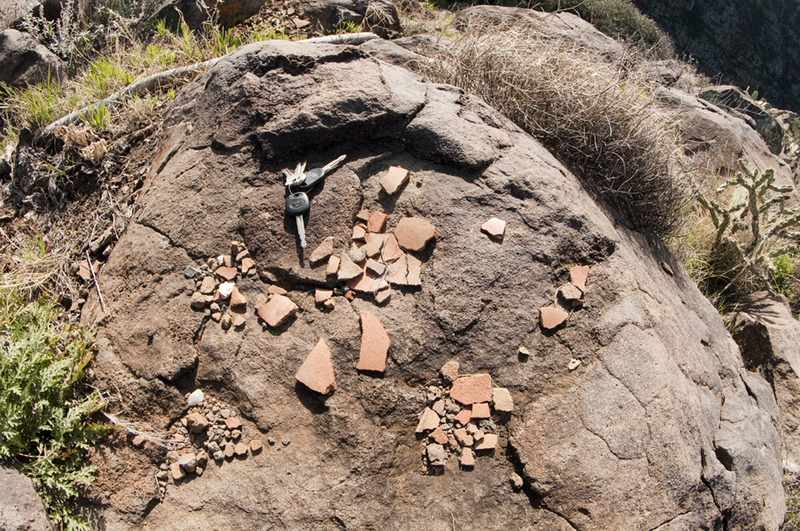 The area around the site contains much evidence of past occupation, including manos and metates, potsherds, obsidian flakes, and arrow-straightener grooves cut into a large boulder. 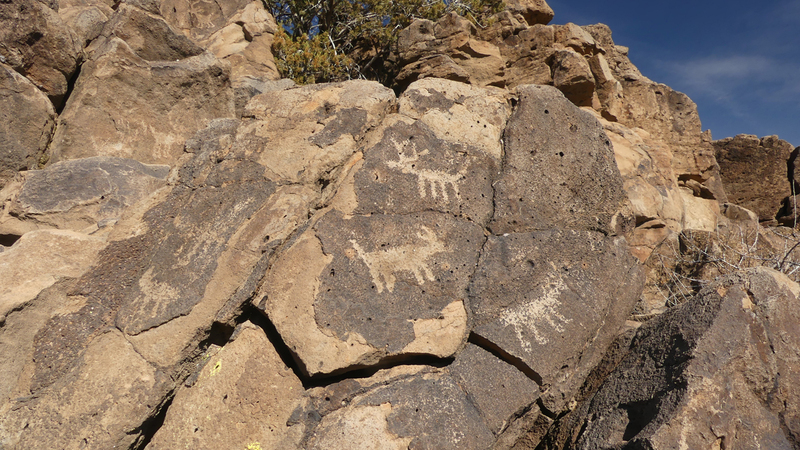 Along the cliff faces are dozens of petroglyphs depicting everything from animals to people to abstract art. 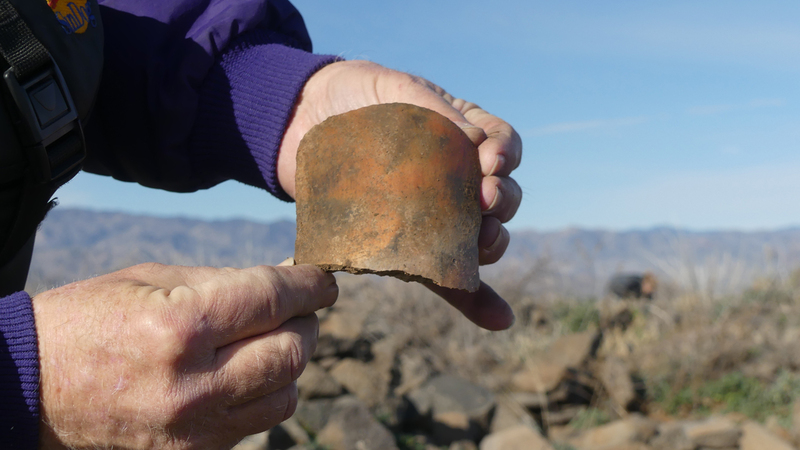 The ground is littered with potsherds, including this interesting curved fragment. 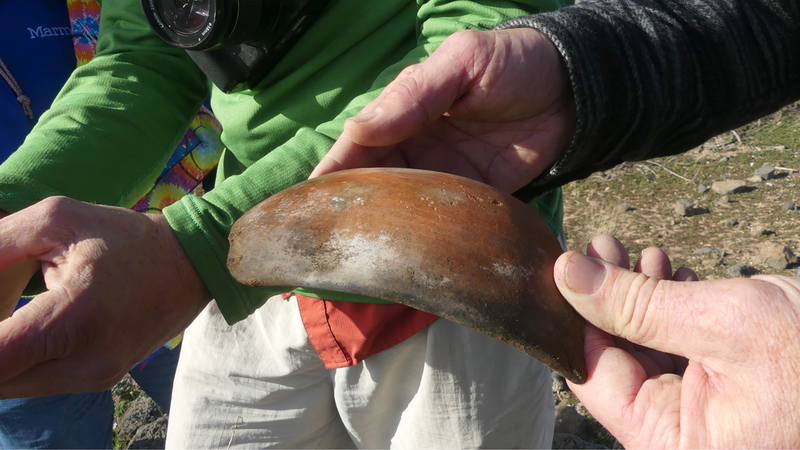 We also found part of a sizable bowl or pot, but we left everything where we found it. 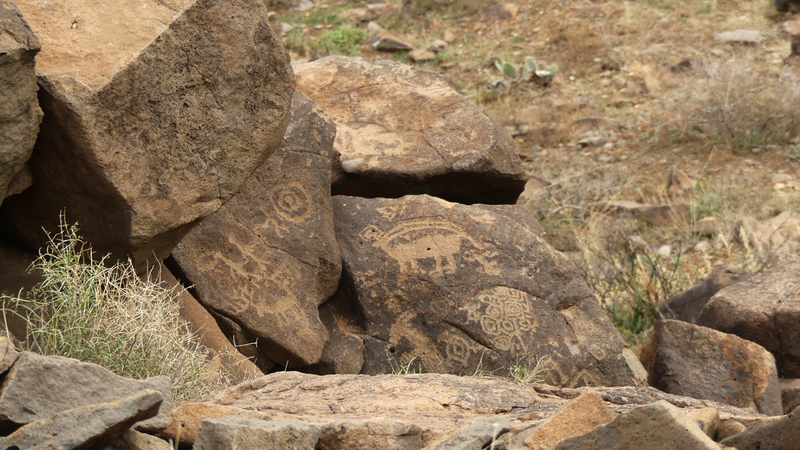 Nearby is another remarkable collection of petroglyphs. 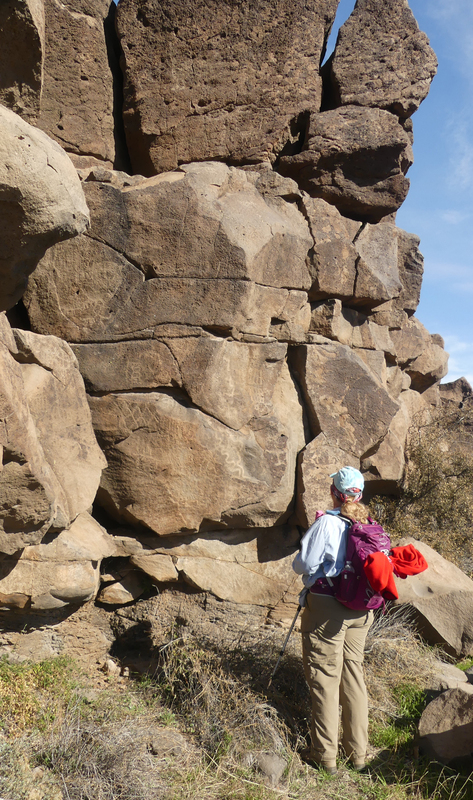 Patty surveys a large vertical petroglyph panel. Are these wagon wheels? Or stars? 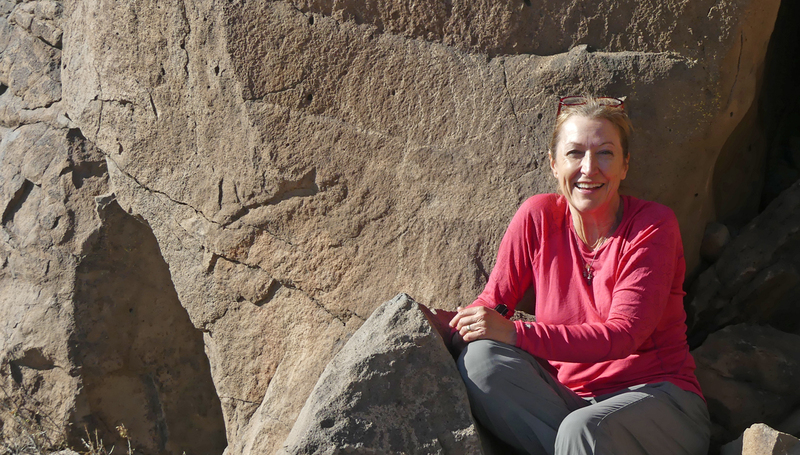 Julia poses by a petroglyph with an impressive set of antlers. 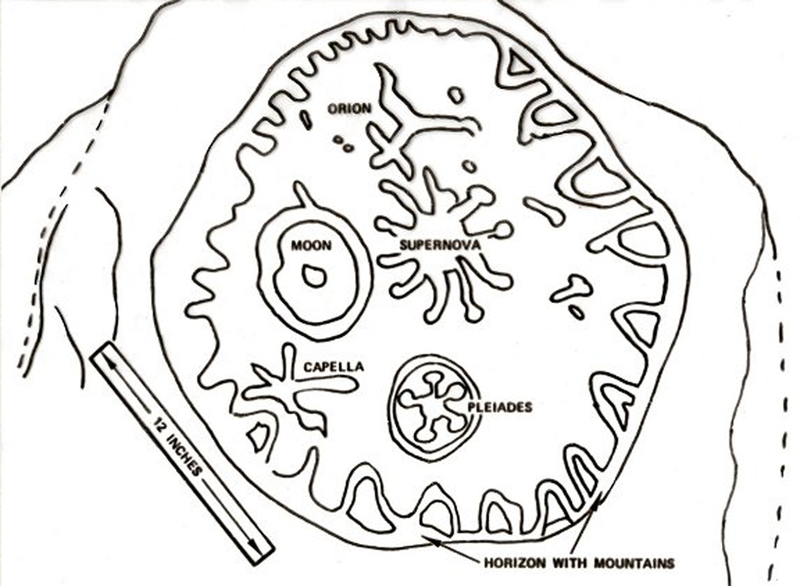 One of several possible petroglyphs depicting the night sky during the Supernova of 1054. 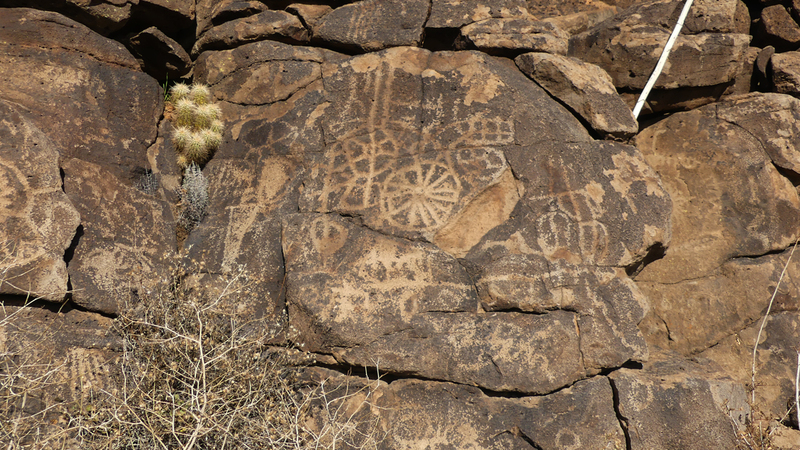 A sketch By Gene A. Lucas shows the possible names of the objects depicted in the petroglyph. Left to right: Jeff, Mitch, David, Rogil, Robin, Julia, Terry, me, Brittany, Patty and Dennis. With possible rain showers in the forecast, we decided to move the camp to another location, past the spot where the road turned to crap. It was a wise choice, because it rained on and off all night long, and the next morning even the relatively good roads were a greasy mess. Under brooding skies, we headed to the next major community, one of the largest in the monument. This complex is even more remote than the first pueblo we visited, so it was in better condition. 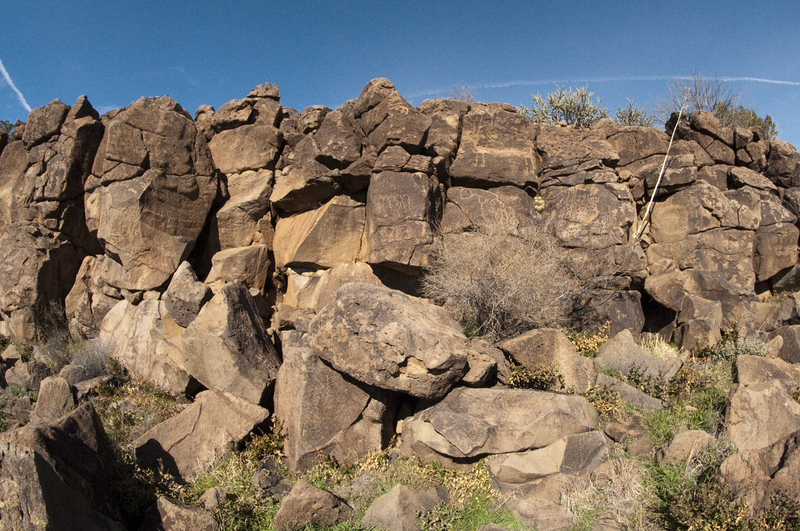 This pueblo has a defensive perimeter wall approximately 800 feet long surrounding approximately two-thirds of the site, with the remaining third being protected by the cliff at the edge of the mesa. 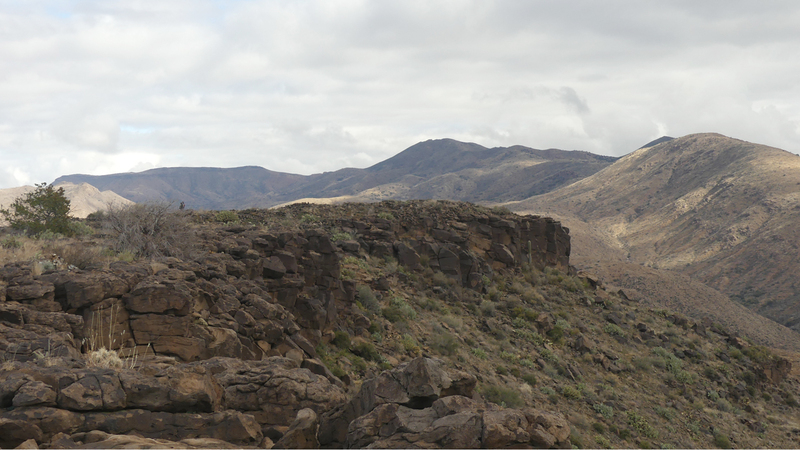 Standing at the edge of this apparent fortress, overlooking a rugged mountain valley with a silver thread of a stream trickling through it, it occurred to me that these remains are the pyramids of North America. 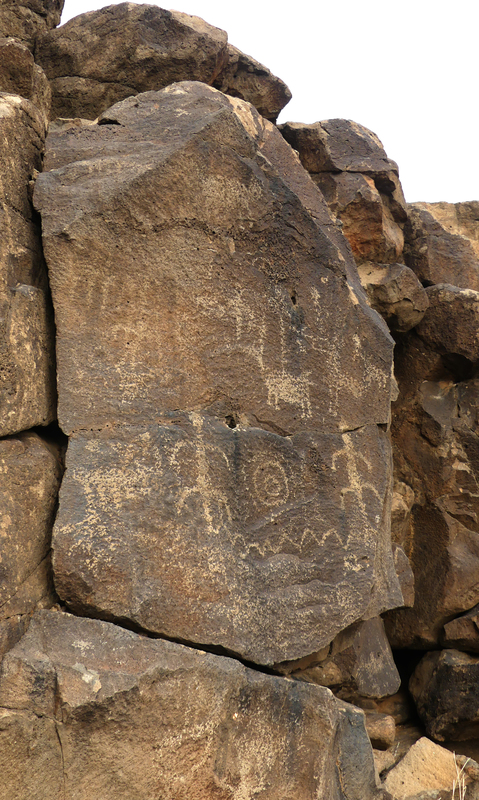 Here as well there are numerous petroglyphs on the cliff faces. Dennis got some great photos with his new fisheye lens! 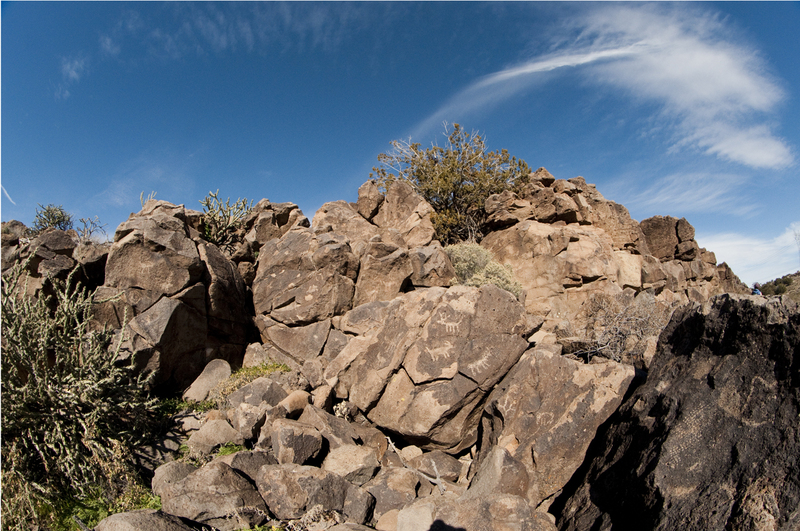 Our last stop was another large complex situated near the head of a small side canyon. We remarked a mix of masonry styles, including some rather rough stonework next to walls constucted with much more care and deliberation. 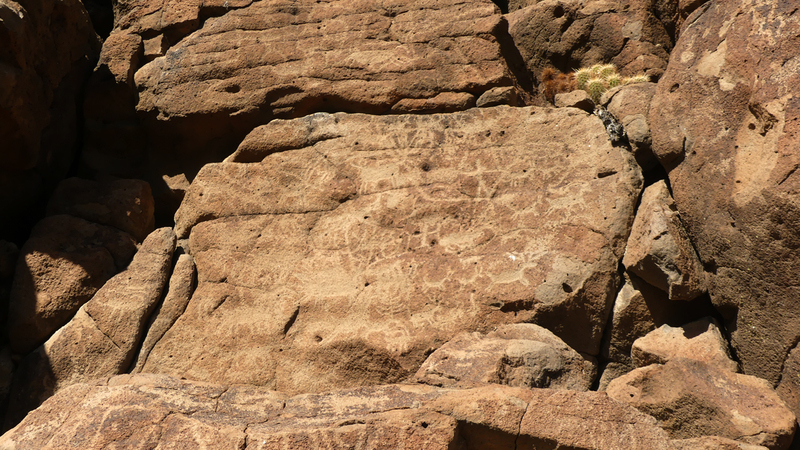 Here again were numerous petroglyphs along the canyon walls. The suns's out, so it must be time to go home! 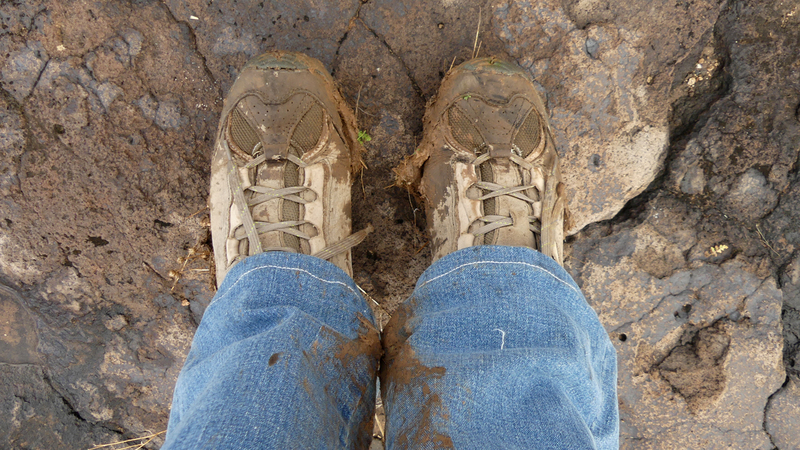 I can tell by my shoes that I had a really really good time!